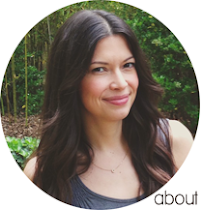 Down and Out Chic: Shabby huh? After making my first pair of shabby chic inspired earrings, I thought I'd explore why it is that I that I've never really discussed shabby chic interiors. I think I'm shy about this French inspired design style because it's SO unlike something I would choose for my own home. I've searched and searched and come up with some examples I really like: they're mostly neutral and you I tried to stay away from the pink + baby blue color scheme that's so typical of these types of spaces. Here, the addition of a modern, streamlined lamp adds a sense of dialogue in the space. The juxtaposition gives relief to the overall frilly feel of the space. Ok, so this space has a mild dose of pink+blue, but look at that wallpaper! The term "shabby chic" is quite the misnomer. The style is quite ornate and the whimsical details are everywhere, including the molding. 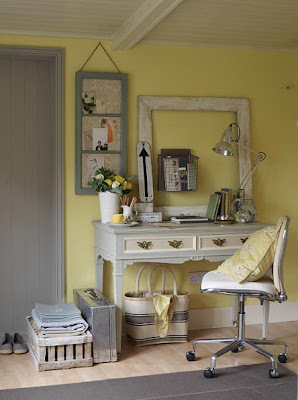 Pale yellow works especially well as an alternative to pink. The generous use of textiles is a must to create a comfortable, shabby chic space. This includes draping fabric over tables and chairs. Don't forget the chandeliers! Creating a romantic ambiance with fanciful lighting is a must. Sticking to a neutral palette, allows you to play with layers of detail without a space getting overwhelming. How beautiful is that bed? Finally, if you must have pink, make sure to add plenty of patterns including gingham and toile. What do you think about these spaces? 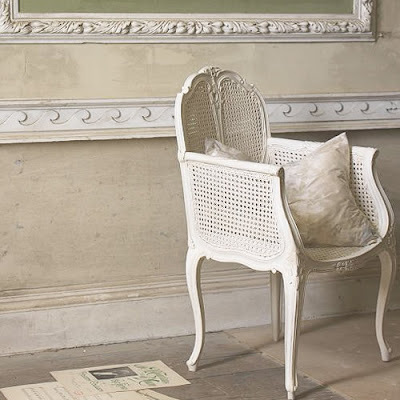 Where do you stand with the shabby chic aesthetic? i really like elements of the shabby chic style (though i hate the name! )...my bedroom is shabby chic inspired...lots of white, balanced with textured throws, woollen pillow covers, silks, muslin, antique shabby furniture (i absolutely adore my walnut veneer wardrobe). instead of pink and pale blue (really not a fan of those colours) i've gone for a dusky mint and a pale grey. i love it! pretty for not too girly to scare away my bloke! oh, and my lamp (i LOVE this lamp) http://www.habitat.co.uk/fcp/product/browse/Floor-lamp-base/989776 in dark red/purple is a nice modern/traditional focus point to the room...i love it sooo much! I love the rooms in pics #1 & 4, and those romantic bedrooms are so pretty! Shabby-chic is tough. I can really appreciate elements of it because of my love for beach cottage design. The challenge for me is to mix is with mid-century modern. I love peeling paint surfaces paired with modern. 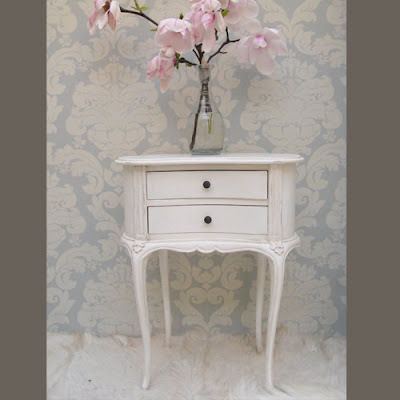 We are so attached to our 50's modern side tables, but I really want to bring some painted pieces into the house. I just don't have any room! Oh, and I'm dying to put a chandelier in our dining room, which is otherwise modern. These are such pretty rooms! I've never jumped on the Shabby Chic train, although you did manage to find some nice options. I actually really like the first one. Go figure! Love the lime and aqua bed but otherwise I'm not huge on shabby chic. It's okay, but probably not what I would pick in my home. I love the delicate detailing on the beds, but I'm usually NOT much for shabby chic. If it leans toward the french country side of things, I might think it's ok, but middle-America Laura Ashley style shabby chic is a little too much for me. And even if I think the room is pretty I don't think I would try to pull it off in my own home. We're a little more midcentury with a contemporary twist. This isn't particularly my style for decor but I loooove that 2nd bed(! )- one from Design is Mine. I love shabby chic although I have a hard time incorporating it. I really love the mirror in the first picture...great post! 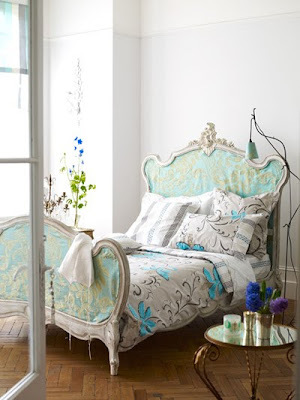 LOVE that turquoise flowered duvet!!! I think I would like one room... but that would be it. Too much makes me feel overwhelmed... I don't know why. the whole shabby chic thing seems to have fallen out of favor with many. but it is still a beautiful way to decorate. and that yellow example you found is amazing! i love it. Its a style I like, but I think I personally would have a hard time putting it together and making it look livable. These pictures you found are lovely though, they all make me want to climb into them! My mom is all about shabby chic but it's borderline home country, so it tends to look more countryish, but i love the photos you chose. It has a more antique feel with some modern tone to it. These are lovely. I have a shabby chic guest room and a semi shabby chic living room...I like it in doses, but wouldn't want to do a whole house in it! 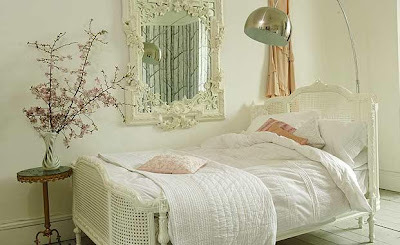 I'm in love with Shabby Chic :) My bedroom was inspired by her ideas. It's adorable in a sophisticated way and it's just girly enough without over doing it. I'm not personally a shabby chic-y person, but in the right setting, it can be appealing (e.g. cottage, older house, etc.) The examples you showed seem classy without being too cutesy. Shabby chic was probably the first design aesthetic that I was ever aware of (thanks to afternoon TV). Therefore, it will always have a soft spot in my heart! These are gorgeous rooms.